The first Youth for Climate march was on 10 January and attracted 3,000 pupils. The second, last week, saw 12,000 show up. And today, police confirmed that there were 35,000 people, marching from Central Station to Place du Luxembourg in the EU district. 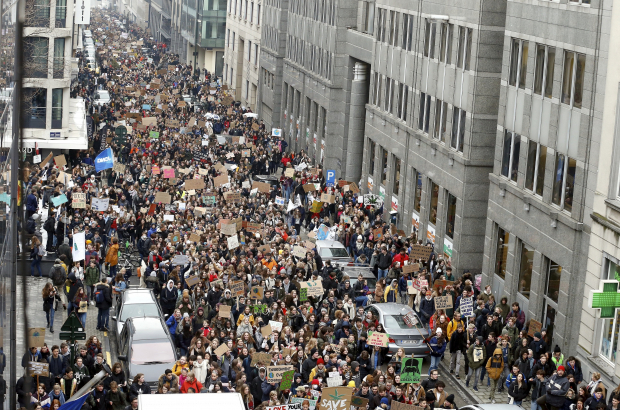 “I think that eventually, we’ll have held the largest climate march ever, and then everyone will see what kind of youth we have in Belgium,” Anuna De Wever, co-founder of Youth for Climate, told Bruzz. Strong words considering that last month more than 65,000 people attended the Claim the Climate march in Brussels. De Wever said that she’s always been “careful” about what she says regarding her expectations, but “the first time everyone said ‘this is just a bit of fun’, and the second time they said I really shouldn’t expect more than that”. Part of the reason for the increase in numbers appears to be due to French-language pupils joining their Dutch-speaking comrades. All of the pupils are skipping school to march for the climate, inspired by Swedish teenager Greta Thunberg. The 16-year-old has made international headlines and was invited to speak at the COP24 last month following her ground-breaking School Strike for the Climate action. While some of the Belgian pupils have permission from their schools to attend the marches, others do not and risk sanctions. While some schools are willing to see pupils disappear for one or two Thursdays, they are not prepared for the threat being carried out: To gather in the streets of Brussels every Thursday until the May elections. “If these children have been absent for two full days, a third day can lead to action being undertaken,” said Kris Van den Bossche, head of Flanders’ Vrij CLB school network. In the meantime, the second Rise for Climate Belgium march is being planned for this Sunday. It starts at 14.00 at North Station. The first such march saw more than 65,000 people taking to the streets of Brussels. On the same day, Act for Climate Justice is planning a protest outside of Rue de la Loi 16, the offices of the federal cabinet and prime minister. The group plans to write on the street in chalk the policy changes that need to happen. Finally, the group Students for Climate, with chapters across Belgium’s higher education institutions, is planning its own climate march on 14 February.